Versatile, modular and fast – that’s the new Ex-product range for solenoid valves. To achieve those attributes all products were developed and reviewed according to the newest regulations. The outcome is a modular coil and valve concept that not only fulfils all current requirements of the explosion protection standard EN 60079 but also offers additional customer benefits. The new concept stands out due to its modularity and simplicity and offers the right solution for your application. 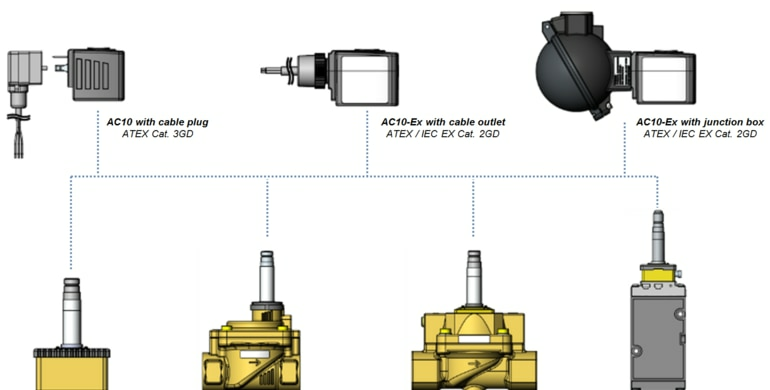 The combination of familiar Bürkert know-how, established electrical connection technology and the current requirements of ATEX and IEC Ex were the challenges overcome by the new product range. The use of the new cable plug Type 2513 enables a versatile installation of the connection line. The cable plug with a moulded cable, certified after ATEX Cat. 3 GD EN 60079, withstands high pull-out forces and therefore offers a safe connection, with which a “fixed installation” all the way to the end device in the conduit or cable duct is not necessary. In the Zones 1 and 21 or in areas with especially aggressive ambient conditions the new epoxy resin encapsulated solenoid valve coil is used. The highly chemical resistant polyolefin cable is even suitable for use in outdoor areas or gas stations. The new explosion-proof junction box combines modern explosion protection with features that allow convenient installation with minimal cable requirements. The high-quality cast aluminium body with a resistant polyester resin coating withstands strong mechanical impact, a broad ambient temperature range from -40°c to +60°C and can be sealed by only one screw. A unique selling proposition of the junction box is the fact that it is designed to be rotated. This allows individual adaptation of the cable outlet direction, actively increases the versatility and reduces costs. Minimizing the wiring efforts even further will be possible with a decentralized fuse that can be installed inside the junction box.